Each Wednesday, the U.S. Army Marksmanship Unit (USAMU) publishes a reloading “how-to” article on the USAMU Facebook page. A while back, the USAMU’s reloading gurus addressed a question frequently asked by handloaders: “How much neck tension is optimal, and how should I select a neck bushing size?” The USAMU offers a straight-forward answer, suggesting that hand-loaders start with a neck bushing that sizes the neck so that it is .003″ less than the loaded outside diameter with bullet in place. From there, you can experiment with more or less tension, but this is a good starting point for many popular cartridge types. In our experience across many calibers, sizing case necks 0.003″ under the loaded-case neck diameter usually yields excellent accuracy. In other words, the sized case neck expands 0.003″ when the bullet is seated. Over the years, we have periodically experimented with increasing neck tension to possibly improve accuracy. In testing with machine rests at 300/600 yards, accuracy often deteriorated as neck tension increased; thus, 0.003″ expansion (from sized neck to loaded neck) is where we usually start. Using the .260 Remington as an example, our loaded cartridge case necks measure 0.292”. Simply subtract 0.003” from that, and use a bushing that sizes necks to 0.289” (after springback). There are exceptions — sometimes, brass may be a bit soft or hard. Some case necks might need, say, 0.001” more tension, but in general, this works well. This .003″ standard of neck tension works very well for single-loaded, long range cartridges. Depending on your caliber and firearm, it MAY also work very well for magazine-fed cartridges. If this neck tension proves inadequate for your purpose, one can increase neck tension as needed while monitoring for possible accuracy changes. Special Considerations for Coated Bullets: If you are using moly-coated bullets, this significantly reduces the “grip” of the case neck on the bullet, and you can expect to have to tighten your case necks accordingly — particularly for magazine-fed ammunition. In any event, we do not crimp rifle cartridges, and advise against it for accuracy handloads. The typical dies used with expander balls are intended to take any cases the user may find, and size them down well below the ideal “spec” to ensure any cases will give good neck tension. The necks are then expanded up to provide heavy to medium neck tension as the expander ball exits the neck. The brass is over-worked, leading to premature work-hardening, and seated-bullet concentricity may suffer. However, the cartridges produced are perfectly adequate for most handloaders. Those who seek finest accuracy generally prefer not to over-work their brass if possible. There are companies which offer to convert one’s standard dies to accept neck bushings, and that gives excellent flexibility. Another, more “old-school” approach, is to have the neck of one’s FL die honed out to the desired diameter for sizing, based on one’s case neck thickness. The expander ball may then be reduced until it barely touches the case necks after sizing, or it may be eliminated entirely. However, once performed, this modification is permanent and leaves fewer options than the bushing route, if one later changes case neck thickness. Those shooters who turn their case necks for optimum neck wall thickness uniformity, or for a tight-neck chamber, will want to take the reduced neck wall thickness into consideration. For example, when setting up a 7mm match rifle to use a standard hunting die without an expander ball, the slightly thinner necks resulted in a perfect 0.003″ reduction in the fired-neck diameter. The result was a low-cost die that fit with custom precision and yielded excellent, match accuracy! Share the post "Smart Reloading: How to Set Optimal Case Neck Tension"
TEN Worst Reloading Mistakes — Do You Agree with This List? Last fall, Shooting Times released an article entitled “Ten Most Common Reloading Mistakes”. Listed below are the Top Ten mistakes hand-loaders can make, at least according to Shooting Times. What do you think of this list — does it overlook some important items? 1. Cracked Cases — Reloaders need to inspect brass and cull cases with cracks. 2. Dented Cases — Dents or divets can be caused by excess case lube. 3. Excessive Powder Charge — Overcharges (even with the correct powder) can be very dangerous. 4. Primers Not Seated Deep Enough — “High” primers can cause functioning issues. 5. Crushed Primers — Some priming devices can deform primers when seating. 6. Excess Brass Length — Over time, cases stretch. Cases need to be trimmed and sized. 7. Bullets Seated Too Far Out — If the bullet is seated too long you may not even be able to chamber the round. Also, with hunting rounds, bullets should not engage the rifling. 8. Burrs on Case Mouths — Ragged edges on case mouths can actually shave bullet jackets. 9. Excess Crimp — This is a common problem with pistol rounds loaded on progressives. If case lengths are not uniform some cases will get too much crimp, others too little. 10. Inadequate Crimp — This can be an issue with magnum pistol cartridges in revolvers. Do you agree with this list? We think some important things are missing, such as not adjusting full-length sizing dies properly. This can cause the shoulder to be pushed back too far (or not far enough). Another common mistake is using brass that is worn out, i.e. stretched in the case-head area from multiple cycles of hot loads. We also think the #1 error a reloader can make is using the wrong powder altogether. That can be a fatal mistake. See what happens when you load pistol powder in a rifle. 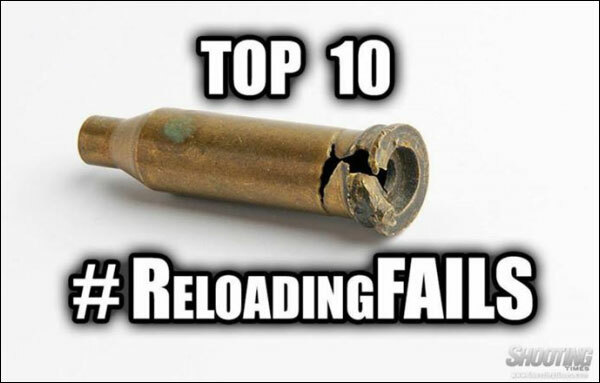 Share the post "TEN Worst Reloading Mistakes — Do You Agree with This List?" LEE Collet dies don’t have a specific mechanical adjustment for neck tension. But you CAN easily modify the die to provide more or less tension. If you want to adjust the neck tension using a Lee Collet die, you can simply chuck the mandrel in a drill and reduce the diameter with some sand-paper (to increase neck tension) or you can order a mandrel the next caliber larger and turn it to whatever diameter you want (the larger the mandrel diameter, the less the neck tension). You can also order custom mandrels from Lee sized to any diameter you want. Lee also offers Custom Collet Dies, made from two fired cases. Lee offers custom standard collet dies for $70.00 (plus S/H) and custom large collet dies for $160.00 (plus S/H). CLICK HERE to ORDER. Some users have complained that their Collet Dies grab the case-neck too firmly, making the case hard to remove. There are solutions to this problem. First inspect the collet fingers and smooth the inner surface up a bit with polishing compound or an extra-fine sanding pad. Second, you can open up the fingers a little bit. LEE recommends that if your Collet Die is sticking, take a steel punch and tap the fingers apart a little bit so that the natural “unloaded” position is wider. Lastly, you should lightly lubricate the outside of the collet fingers (see arrows) before you re-assemble the die. This will ensure they slide smoothly. Also, to prevent the collet fingers from closing too tight, never load up the die with your press without putting a case in place first. Without a case neck between the collet fingers and the mandrel, the collet can clamp itself too tight as you raise the ram. After reaching fully “down” on your press handle, withdraw the case about an inch and manually rotate it about 1/8th (NOT 1/4 or 1/2) turn while still in the shell-holder, then size again. This will place the die’s collet petals on the four “high spots” of the case neck and will result in a rounder, more evenly-sized neck with slightly more bullet tension. This takes only about one second more per case and is well worth the slight extra effort. (We thank reader Stonecreek for this smart tip). Share the post "How to Neck-Size Cases with LEE Collet Die"
Each Wednesday, the U.S. Army Marksmanship Unit (USAMU) publishes a reloading “how-to” article on the USAMU Facebook page. In this article, the USAMU’s reloading gurus address a question frequently asked by prospective handloaders: “Should I buy a single-stage press, or a progressive?” The USAMU says the best answer is Solomon-esque in both its wisdom and simplicity: “Get BOTH!” However, there is definitely more to the issue, as the USAMU explains below. Many are the beginning handloaders who have asked a friend about their “setting up” a progressive press for them. The idea is that the newbie could then just feed in components and crank out buckets of practice ammo without needing to really learn much about handloading. Tempting though this might be, that’s simply not how it works. Such an approach might be ok if there were never a malfunction with either press or operator, but that’s unrealistic. Our hypothetical newbie would then lack the knowledge to problem-solve most situations. Worse yet, several different handloading operations would be occurring at different stations on the progressive press at the same time. It takes an experienced operator to keep track of, and truly understand the significance of, all those potential mini-problems. Loading without this experience is a recipe for potential disaster – such as a double powder charge (especially with pistol cartridges) dropped while the loader was attending to some other function, etc. Progressives are an animal unto themselves, and while they offer many benefits, they do take some getting used to – even by experienced handloaders! Here, enter a 40-year veteran handloader who decided to jump onto the progressive bandwagon late in his career, having used only single-stage presses all his life. A High Master NRA High Power Rifle competitor, he had no background in competitive pistol shooting, where historically most progressive presses are found. Experienced Action Pistol shooters have typically encountered multiple episodes in which shooters “skipped” a powder charge for some reason, leading to a squib round and a bullet possibly lodged in the bore. Thus, at matches, it’s reflexive for them to yell “STOP!” in unison if they see a shooter get a “click” vs. a “bang”, and rack the slide to keep firing. This writer has personally seen several pistols saved in just such scenarios over the years. Our High Master set up a popular progressive press and began turning out .223 Rem 100-yard practice ammo with abandon. He was using a moly-coated 52gr match bullet and an economical, fast-burning surplus powder that gave great accuracy. Once on the range, he began practicing strings of rapid-fire. All was well, until he heard “Click!” rather than “Boom”. Lacking the above experience or onlookers to halt him, he reflexively operated the charging handle on his expensive, custom NM AR15 Service Rifle, and the next trigger squeeze reportedly registered on seismographs over at least a three-state radius. He sat, uninjured but bewildered, until the hail of expensive bits and pieces quit raining down around him. When the smoke cleared, he immediately cursed the horrid, evil, demonically-possessed progressive press for this, his first-ever reloading mishap. His $1400 NM upper was ruined, but thankfully, his $800 pre-ban lower… and he had escaped injury. It illustrates why we at the USAMU Handloading Shop agree in recommending that new handloaders should begin with a single-stage press. Once one thoroughly learns the steps in each phase of handloading by repeated experience, then one will be qualified to move on to a progressive press. The single-stage press will REMAIN virtually indispensable for one’s entire handloading career, even after having purchased a progressive press (or two). There are endless small projects that are best handled on a single-stage press, and a poll of USAMU’s Handloading staff reveals that not one would willingly be without his single-stage press, despite owning at least one progressive. Share the post "USAMU Advice for Progressive Press Users"
Here are some really smart tips for hand-loaders compiled by Sierra Bullets. These suggestions were submitted by Sierra’s Facebook fans — and some are very valuable indeed. Some of these tips will help you load more accurate ammo. Other selections will help you stay SAFE — which should always be your #1 priority. For example, we concur with the advice to “Check and Double Check. Everything. Every Time”. Also definitely keep “One powder on the bench at a time” — that could be a life-saver. You may want to print these “words of wisdom” and place them on a wall in your loading room. Share the post "Important Reloading Safety Tips from Sierra Bullets"
You can never be too safe when hand-loading your own ammunition. This helpful Brownells video outlines the Seven Fundamental Reloading Safety Tips. This is important information for novice hand-loaders and a good refresher for those with reloading experience! 1. Store your reloading supplies in a safe and dry location, away from children and away from any possible source of ignition. This includes keeping your powder and primers separate. 2. 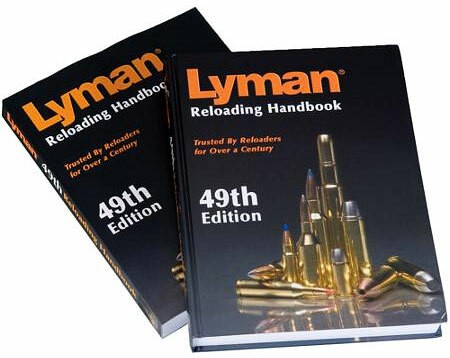 Get and use respected reloading manuals, especially for new cartridges. Start low and work up slowly while watching for warning signs of pressure and/or case fatigue. 4. Do NOT mix powders. Keep your powders clearly marked and dated. You can use masking tape to write the date on the container. 5. If you load the same cartridge type for different firearms, make sure your ammo headspaces properly in each gun. 6. Check cases frequently. Look for split necks, case head separation or other signs of fatigue and excessive pressure. 7. If reloading military brass, be aware that case capacity is usually reduced, and initial loads should be at least 10-15% lower than published data. Powder Type — Always double-check the label on your powder containers. After placing powder in the powder measure, put a piece of tape on the measure with the powder type written on it. Some guys write the powder type on a card and place that right in the hopper. Scale Drift — Electronic balances can drift. If you are using a digital powder scale, calibrate the scale with a test weight every 50 rounds or so. Case Fill — If you throw more than one charge at a time, look INSIDE every case before seating a bullet. Squib charges can be dangerous if you don’t notice them before firing the next round. Progressive Presses — When using a progressive press, consider using an RCBS Lock-Out Die. This will detect a low charge and stop the machine. These dies will work with RCBS, Hornady, and Dillon progressives. Share the post "Follow These Safety Fundamentals When Hand-Loading Ammo"
Each Wednesday, the U.S. Army Marksmanship Unit publishes a reloading “how-to” article on the USAMU Facebook page. Yesterday’s post covered primer seating depth. This article offers many useful tips — including a clever way to measure primer seating depth with ordinary jaw-type calipers. Visit the USAMU Facebook page next Wednesday for the next installment. The first concern is for safety: for that reason, primers should be seated below flush with the case head. One primary cause of “slam fires” (which includes catastrophic failures from firing out of battery) is “high,” or protruding primers. These stand above the case head, are readily felt with simple finger-tip inspection, and may fire when slammed by the bolt face and/or a floating firing pin in feeding. Here at the USAMU, we ensure our rifle primers generally run -0.003″ to -0.005″ below the case head. Maximum primer depth is -0.006″ and minimum is -0.002″. Upon inspection, any cases with high primers will be corrected before loading. Aside from improving ballistic uniformity, ensuring the primers have proper compression upon seating also helps reduce possible misfires. These can be caused by the firing pin’s expending part of its energy either seating the primer or having to deform the primer cup enough to reach the anvil. A zeroed, precision set of standard calipers will also measure primer seating depth. (You don’t really need a custom tool.) Merely close the jaws and place the calipers’ narrow end squarely across the center of the case head/primer pocket. Keeping the narrow end in full contact with the case head, gently open the jaws, and the center bar will extend until it reaches the primer face. Voilà! Primer depth is read on the dial. Taking a few measurements to ensure accuracy and repeatability is recommended until one is familiar with this technique. Factors affecting variance of primer seating depth include brass maker and lot number — all primer pockets are not created equal! Another factor is the primer manufacturer and individual primer lot. We’ve encountered occasional primer lots by top-quality makers that included some primers with slight defects affecting seating. While finely accurate, these primers were out-of-round or had small slivers of cup material protruding which affected primer feeding or seating depth. Has one’s brass been fired previously? If so, how many times and the pressures involved also affect future primer seating. Obviously, this is another factor in favor of segregating one’s high-accuracy brass by maker, lot number, and number of times fired, if possible. The next question, “How do we measure primer depth?” happily can be answered using tools already owned by most handloaders. [See tip above on how to measure depth with calipers.] At the USAMU, we have the luxury of purpose-built gauges made by the talented machinists of the Custom Firearms Shop. One places the primed case into the gauge, and the dial indicator reads the depth quickly and easily. The indicator is calibrated using a squarely-machined plug that simulates a case head with a perfectly flush-seated primer, easily giving meaningful “minus” or “plus” readings. The gauge is usable with a variety of case head sizes. Methods of primer seating include hand-seating using either hand held or bench-mounted tools, vs. progressive-press seating. Progressive presses may either seat by “feel,” subjective to each operator, or by using a mechanical “stop” that positively locates primers nearly identically every time. Testing here has shown that we get more uniform seating with the latter type progressive press, than we do with a high-quality bench-mounted tool lacking a positive stop. Primer stop depth adjustments on our main progressive presses involve turning a punch screw in and out. While the screw is not calibrated, fine “tick” marks added to the top of the press help users gauge/repeat settings by “eye” efficiently with practice. Then, once a sample of primed cases is run to confirm the range and accuracy of depths, the identifying lot number and maker is noted on the press for reference. When it’s necessary to switch brass/primer lots, changes are easy to make and settings are easily repeated when it’s time to switch back. Share the post "Primer Seating Depth Uniformity and Accuracy"
A unique, comprehensive Cartridge Comparison Guide is available as a 340-page, spiral-bound book. Covering over 250 cartridges, the updated Second Edition of the Cartridge Comparision Guide is the product of many years of labor by Andrew Chamberlain, a Utah-based hunter. Andrew says his Guide “compares every factory available cartridge from the 17 calibers up to the 50 caliber cartridges”. (Sorry, most wildcat cartridges are not covered.) 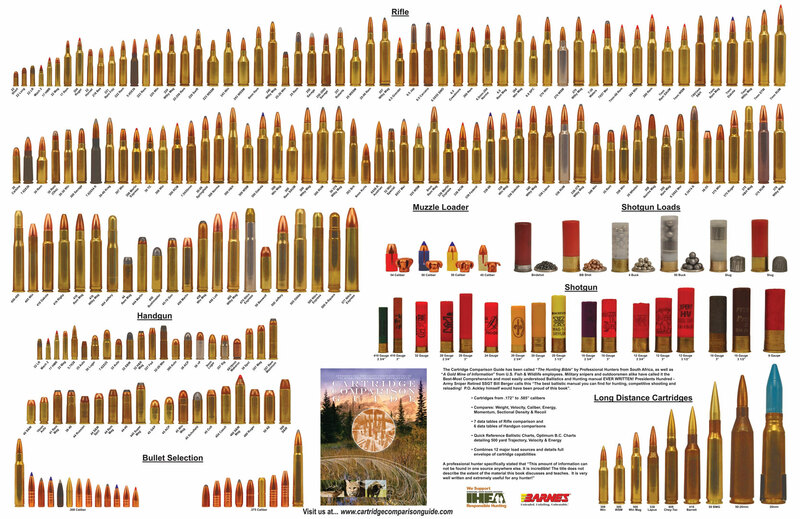 Chamberlain’s Guide also compiles cartridge data from major ammunition manufacturers such as Barnes, Federal, Hornady, Norma, Nosler, Remington, Sierra, Swift, Weatherby, and Winchester. It shows the optimal velocity achieved for each bullet weight and calculates bullet energy, recoil, and powder efficiency. Large color photos illustrate handgun and rifle cartridges. The Cartridge Comparison Guide provides data for thousands of cartridge/bullet/velocity combos. Quick reference data sheets and ballistics charts cover Trajectory, Velocity, and Energy out to 500 yards. The Cartridge Comparison Guide also offers a firearms lexicon, plus Appendices covering Cartridge Selection for Game Animals, Bullet Selection/Design, Bullet Expansion, Wound Channel Characteristics and more. Addition of Shotgun Ammunition (Both Slug and Shot loads). Integration of Shotgun Slug Ammunition with Center Fire Rifle Data Tables. Factory Load Summary Added (Shows manufacturers and loads produced). One factory load and one hand load for every bullet weight available in each cartridge. Over 90 pages of additional ballistics content (roughly 35% more than in First Edition). The Cartridge Comparison Guide has been awarded the POMA Pinnacle Award for Excellence. (POMA, the Professional Outdoor Media Association, is the trade association for outdoor writers). Share the post "Cartridge Comparison Guide Covers 250+ Cartridges"
Editor’s NOTE: K22 echoes the advice we give to new hand-loaders. We suggest that novices find an experienced mentor who can “show them the ropes” and guide them through the basics. *We recommend that you always double-check printed load data with the latest web-based data from the actual powder manufacturers. Powder properties can change. The most current powder data is usually found on the powder-makers’ websites. Share the post "For Novice Reloaders, the Winner Is…"
We recommend that all hand-loaders have a couple reliable reloading manuals as reference guides. 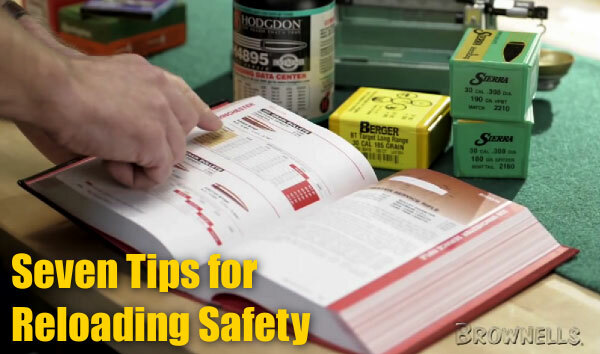 Berger, Hornady, and Sierra all offer well-respected load manuals. These can provide starting load information for a wide variety of cartridge types and bullet selections. We do like to cross-check any printed load recipes with current online data, to ensure you have the latest info. Along with a good load manual, those getting started in metallic cartridge reloading can benefit from a good basic reloading treatise. There’s a new intro guide from the publishers of Gun Digest. The New Gun Digest Shooter’s Guide To Reloading, by Phillip Massaro, was created for shooters new to reloading. This is a good starting point for those who want to learn to hand-load safely and efficiently. Hundreds of photos illustrate the text — and we all know a picture can be worth a thousand words. After discussing the benefits of hand-loading, Massaro’s book covers the basics of metallic cartridge reloading, step by step. Along the way Massaro recommends appropriate presses and tools for reloading both pistol and rifle cartridges. Massaro also explains the variations in bullet and powder types, and how they affect ballistics. In addition, Massaro includes a “Specialty Situations” chapter that reveals common reloading mistakes and issues and offers practical solutions. This section on avoiding common mistakes is one of book’s best features. We wish all reloading guides had a similar section. Editor’s NOTE: This book will be released next week. Accordingly, we have not seen the final, printed version yet. 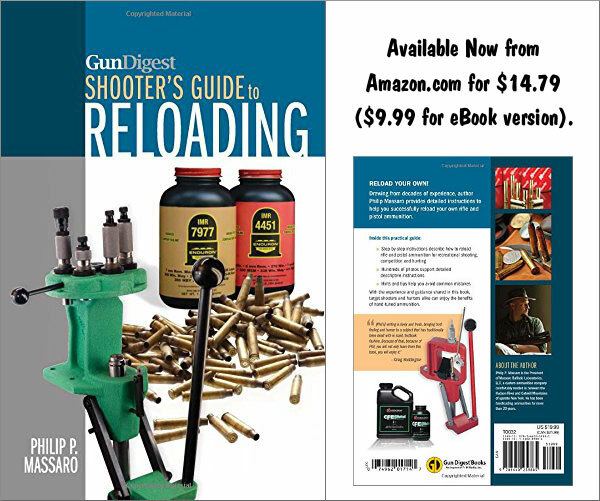 At $14.79, the Gun Digest Shooter’s Guide to Reloading is relatively inexpensive. The sample chapters we reviewed provided good basic information in a well-organized fashion. Certainly, we would not tell advanced reloaders and/or competition shooters to rush out and buy this book. 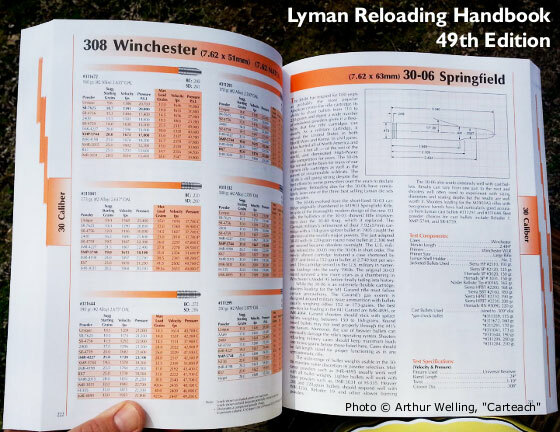 However, for folks getting started in hand-loading, this resource should be helpful. Share the post "New Gun Digest Shooter’s Guide to Reloading"